“Blood moons” have marked significant events in Israel’s history. In Joel 2:31 we are told that there will be signs in the sun and the moon before Jesus Christ’s second coming. Joe 2:30-32 And I will shew wonders in the heavens and in the earth, blood, and fire, and pillars of smoke. 31 The sun shall be turned into darkness, and the moon into blood, before the great and the terrible day of the LORD come. 32 And it shall come to pass, that whosoever shall call on the name of the LORD shall be delivered: for in mount Zion and in Jerusalem shall be deliverance, as the LORD hath said, and in the remnant whom the LORD shall call. Notice that these verses directly relate to the nation of Israel. The sun will be darkened and the moon will become blood red. These signs will indicate the approaching judgment of God on Israel’s enemies. These signs will likely be most visible in Jerusalem. Verse 32 above indicates that Jews will be rescued on Mt. Zion. Mt. Zion is the hill just south of the temple mount in Jerusalem. There will be a small group of Jews on Mount Zion who will survive the Tribulation (please read my commentary titled “The Last Jews in Jerusalem”). Below, Revelation 6:12 is quoting Joel 2:31. It is important to note that according to these verses these signs do not foretell the approach of the Tribulation period. Instead these verses most certainly pertain to the end of the seven year Tribulation period. They foretell the day of Jesus Christ’s vengeance and wrath on Israel’s enemies. Before Jesus returns in power and vengeance against Israel’s enemies the sun shall be turned into darkness, and the moon into blood. These signs will be visible to the Jews bunkered on Mount Zion. Before Jesus returns to vanquish Israel’s enemies and to save the surviving Jews in Jerusalem there will be signs in the heavens and in the earth. Below, Jesus confirms that these signs occur near the end of the Tribulation period. There will also be signs in the heavens in Jerusalem beginning on Passover in April 2014. For the following two years solar and lunar eclipses will occur on several Jewish holy days. These eclipses may have some significance since so many fall on Jewish holy days but some of these eclipses will only be partially visible from Jerusalem. These events are rare and certainly notable but they should not be equated with the events described in Joel. They do not mark the eminent second coming of Jesus Christ in fury to rescue Israel and rule on earth forever, but they could mark some other profound event like the dividing of Israel to form a Palestinian state or the loss of east Jerusalem. Perhaps these signs could prophesy the rebuilding of a temple in Jerusalem and the renewal of temple sacrifice. They may also predict the near coming of Jesus Christ for his Church, as well as forecast the terrible time of God’s judgment for Israel and also for all of the earth known as the Tribulation period. The cycle of the moon marks the Hebrew calendar as well as marks God’s holy days of meeting with Israel (Leviticus 23). There is a Hebrew theory that says that signs in the moon pertain to the nation of Israel, and that signs in the sun are almost certainly warnings against the gentile nations. Solar and Lunar eclipses fall on several Jewish holy days in 2014-2015. These events occur spanning two years on the Hebrew calendar; the years 5774 and 5775. The year 5775 is also a Sabbatical year (Leviticus 25) on the Hebrew calendar which ends a seven year cycle. The next seven year cycle will begin at sunset on Rosh Hashanah September 13, 2015 with a partial solar eclipse. God promised Israel that they would suffer seven years of tribulation before the Messiah returns to set his kingdom in Jerusalem. Perhaps Rosh Hashanah 2015 will mark the beginning of the next seven years of Israel’s trouble and also God’s wrath on earth. Here are the dates of the upcoming solar and lunar eclipses. April 15, 2014 – Passover – Total lunar eclipse (blood moon): What happened on this day? God rescued Israel from slavery in Egypt (Exodus 12). Passover lasts seven or eight days. Passover is the first of God’s appointed holy days of the year. 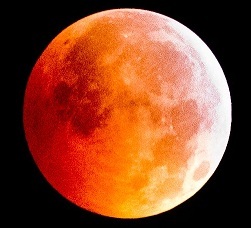 October 8, 2014 – Feast of Tabernacles (also called Sukkot) – Total lunar eclipse (blood moon): What happened on this day? Sukkot commemorates Israel’s 40 years long pilgrimage from Egypt to Israel (Lev 23:34). Sukkot lasts seven or eight days. March 20, 2015 – First day of the Hebrew calendar year (Exo.12:1-2) – Total solar eclipse: What happened on this day? One year after God appointed this day as the first of the year Moses set up the tabernacle. The Shekinah glory of God fell upon the tabernacle on this day (Exodus 40:2, 17, 34). April 4, 2015 – Passover – Total lunar eclipse (blood moon): God rescued Israel from slavery in Egypt (Exodus 12). Passover lasts seven or eight days. Passover is the first of God’s appointed holy days of the year. September 13, 2015 – Rosh Hashanah, Feast of Trumpets – Partial solar eclipse: What happened on this day? Rosh Hashanah is a solemn day that marks the beginning of Israel’s high holy days (Leviticus 23:23-25). The high holy days encompass a ten day period of repentance which concludes with Yom Kippur (also called the Day of Atonement). Rosh Hashanah is celebrated by the blowing of the ram’s horn. In Hebrew this horn is called the shofar. Rosh Hashanah is the start of the Hebrew civil year. September 28, 2015 – Feast of Tabernacles (also called Sukkot) – Total lunar eclipse (blood moon): What happened on this day? Sukkot commemorates Israel’s 40 years long pilgrimage from Egypt to Israel (Lev 23:34). Sukkot lasts seven or eight days. What do these signs mean? Are they significant? I think so. This many eclipses falling on Israel’s God appointed holy days is very rare. In the past they have marked incredibly significant events in Israel’s history. Namely Israel’s rebirth as a nation in 1948, and the recapture of east Jerusalem and the temple mound in the six day war of 1967. Do the eclipses of 2014-2015 mark Christ’s second coming to rescue Israel? No. Could they mark other prophetic events regarding Israel and the gentile nations? Yes. Here are just a few that come to mind. 1. Peace agreement or “Two state solution” imposed on Israel (1Thess 5:3). 2. Plan to rebuild Temple in Jerusalem (Rev 11:1). 3. Israel receives her “idol shepherd” (Zechariah 11:16-17). 4. The destruction of Damascus (Isaiah 17, Jeremiah 49). 5. Turkish led invasion into Israel described in Ezekiel 38. 6. The revealing of the Antichrist on earth (2Thessalonians 1-3). 7. Christ’s return in the air for the rapture of the Church (1 Thessalonians 4:16-17). 8. The beginning of seven years of God’s judgment on all the earth (Isaiah 28:22). God ordained Israel’s holy days to commemorate Israel’s history and relationship with God. God also ordained Israel’s holy days to foretell things that will come to pass in the future. The verses below were written to Jewish and gentile Christians in the early Church. Colossians 2:16-17 Let no man therefore judge you in meat, or in drink, or in respect of an holyday, or of the new moon, or of the sabbath days: 17 Which are a shadow of things to come; but the body is of Christ. God’s appointed holy days foretell the major events of the future. The major events of the future have eternal weight. These major events are; God’s rebuke of Israel (Dan.12:10), Jesus Christ’s judgment of the unbelieving world, Jesus Christ’s rescue and restoration of the nation of Israel, and Jesus Christ’s everlasting kingdom on earth. The Church is suffering at the hands of the world today but it will escape God’s judgment on earth and enjoy Christ forever. The following verses were also written to the Church. Please notice that the day of the Lord comes upon the world unexpectedly. I think that the entire seven year Tribulation period can be characterized as the day of the Lord or as the day of the Lord’s wrath on earth. It comes unexpectedly upon those who are in the dark, but those who are awake and are in the daylight can see it coming! If you are walking in the daylight of belief in Jesus Christ and in the understanding of his word, then you will see the time of God’s wrath on earth coming; and you will also be rescued from it! 1 Thessalonians 5:1-11 But of the times and the seasons, brethren, ye have no need that I write unto you. 2 For yourselves know perfectly that the day of the Lord so cometh as a thief in the night. 3 For when they shall say, Peace and safety; then sudden destruction cometh upon them, as travail upon a woman with child; and they shall not escape. 4 But ye, brethren, are not in darkness, that that day should overtake you as a thief. 5 Ye are all the children of light, and the children of the day: we are not of the night, nor of darkness. 6 Therefore let us not sleep, as do others; but let us watch and be sober. 7 For they that sleep sleep in the night; and they that be drunken are drunken in the night. 8 But let us, who are of the day, be sober, putting on the breastplate of faith and love; and for an helmet, the hope of salvation. 9 For God hath not appointed us to wrath, but to obtain salvation by our Lord Jesus Christ, 10 Who died for us, that, whether we wake or sleep, we should live together with him. 11 Wherefore comfort yourselves together, and edify one another, even as also ye do. Don’t be in the dark. Consider the many end time events that are unfolding right now; namely the nearing of the destruction of Damascus, and the conflict amongst Egyptians. Notice that the heathen are raging in the Middle East and Africa and Asia. Also recognize the armies of Ezekiel 38:5 gathered in Syria. Hear the cry of “peace peace” in Israel, and more. These rare celestial events in Jerusalem are bound to be signs that usher in a new era for Israel and for the entire world. God told us these things in advance so that we would believe in him and in his son that he sent to us. Will you be saved from the coming day of the Lord? Believe on the Lord Jesus Christ, and thou shalt be saved, and thy house (Act 16:31). Do you believe that these signs are literally a result of lunar and solar eclipses, or some other celestial events? Many speculate about planets, comets, asteroids, stars, and weather events. I have always looked at those interpretations with a jaundiced eye and filed them away in the (When I see it, then I will believe it) file. Anyways if they did occur after rapture, we would have a great view. Kind of an indirect way of asking you about Wormwood, Planet X, and so on. It is obvious that you have not written about such things that I am aware of. The 2014-2015 eclipses are not mentioned in the bible. Perhaps the signs during the Tribulation will be something other than eclipses. I don’t know anything about planet x.
I personally do believe this is literally a result of the lunar and solar eclipses. After all, who rules the sun, stars and sky? Jesus Christ, our Lord and Savior! I believe it is best to keep our focus on the Bible, watch and pray for Christ’s soon return, and pray for the hundreds of thousands of Christians that are being persecuted and killed in the name of Allah. I have specifically been praying for the election in Israel in two days, but I fear that your prediction of an Idol Shepherd may happen sooner than latter.